Ask fellow campers about "Gold Rush Campground" and nearby attractions. Walking distance to downtown, friendly helpful staff. Very tight for large RV, my slide was 1 ft from neighbors awning. Had to get the site across the street to move his toad so I could back in. We camped at Gold Rush Campground in a Motorhome. Typical of many of the RV park/campgrounds in this area. A large gravel area divided into slots for parking with a line of pull throughs down the center and a ring of back-ins on the perimeter. The pull through slots had sewer connections and 30A service for a higher rate. The sign says 15A, and from the scorched look of the outlets, folks are trying to run their AC or high load appliances. There are no breakers on the 15A row. The back-in sites have 15A outlets and water only. There is a dump station at the front corner of the property but most will have to stick out in the lightly traveled street. Center pull throughs had sewer, dump near exit. The travel aisle is wide enough for easy maneuvering. Parking is very close; the 2 back corner sites seemed to have the most room. This is the closest RV park to the ferry and is within easy walking distance to the downtown shops and restaurants. We camped at Gold Rush Campground in a Travel Trailer. Diamond Tooth Gerties is a few blocks from the campground. They have 3 nightly 1890s song and dance shows (can can girls), each are different and the 1 time admission fee is good for the whole season. This is a non profit casino with proceeds going to renovate and improve Dawson. 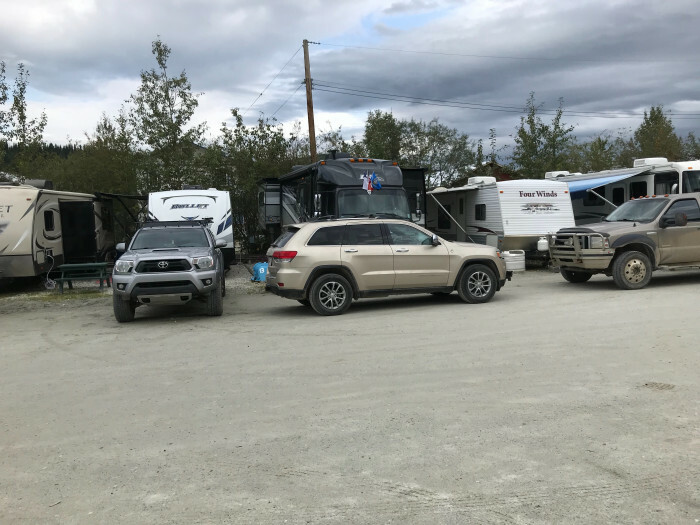 This is typical of all the RV parks in Canada and Alaska. They are expensive, no amenities, no privacy, no atmosphere, just a plain gravel lot with hookups. This one is in town and convenient to all the town has to offer. The showers are $2 for 5 minutes . Laundry is $3.50 for washer, $2.50 for dryer. ATT good, Verizon good. Park has a great late check in program with open sites listed on office door. Tear off the one you want and they will collect the next morning - EARLY. The staff was pleasant and helpful, though brand new employees. Fair, would stay there again. We camped at Gold Rush Campground in a Motorhome. Dawson City was a surprise and we wish we could have spent a couple more days. There is a free ferry, across the river (no bridge), to access the Top of the World Highway. Convenient in town location. Do not miss Diamond Tooth Gertie's. Great view of town at the top of the hill. Good friendly service. Worked well with us to fit our rig and trailer in a spot. 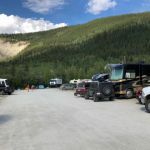 A little more expensive than the other RV parks, but worth the money since you are within walking distance of all the shops and entertainment Dawson City has to offer. I'd stay here again. We camped at Gold Rush Campground in a Truck Camper. 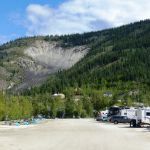 This campground is in downtown Dawson City. If you want quick access to the town, no driving, it's the place for you. If not, go to the other campgrounds which are around the river bend but parking is crowded and sparse on busy days in the city. We were here on Canada Day, so parades were in order, but not only that, it was Canada 150!!! Of course the place was packed. I will point out that walking around town was fun and convenient and we enjoyed the short parade. the campground is a parking lot with hookups. Roads between the sites are wide but the site we had was so narrow, we could not put one slide out because the people next to us would have had trouble getting out their door. They did park backwards which didn't help. We survived. Be sure to consider all the factors of close proximity to town vs each other when deciding to use this campground. I won't say it's bad, just be sure you like to be close to others. We camped at Gold Rush Campground in a Fifth Wheel. Very tight spaces, got to know our neighbors! As others have said, it is basically a parking lot with hookups. The roadways were wide but the sites were narrow. Loved being able to walk everywhere. Stayed 2 nights, was only going to stay overnight but there is so much to do and see. Well worth the trip. Only campground in city where you can walk everywhere. We camped at Gold Rush Campground in a Fifth Wheel. Robert Service cabin, Jack London Museum, Diamond Tooth Gertie's Casino and can-can shows, City Museum, Visitor Centre, the First Nation Heritage Centre, ride the steam wheeler, etc. Many many things to do and see. This campground is a large rectangular gravel parking lot with back-in sites around the edges and a few pull-throughs in the middle. The back-ins are far too narrow. Mine was barely 14' wide and our slides were 6 inches from our neighbor's slide. Our site was about 35' long, although some were longer and some were a little wider. Bushes along the perimeter were overgrown limiting how far you could back in and some trees had branches brushing your slides. About the only good thing is you are in the middle of Dawson City and walking distance from attractions. Cell coverage was good. We camped at Gold Rush Campground in a Fifth Wheel. Basically this is an RV parking lot. The biggest plus is that you are right in town and can walk to restaurants, bars, shops and sites. Dawson City is a funky place....lots of young, free spirited people. Dirt streets and lots of old, closed buildings. On top of the nightly rate, you have to pay $2 for a shower. Some sites had tables. Not ours. Glad we only had two in our party. If you want to be close to the action, stay here. We camped at Gold Rush Campground in a Motorhome. Friendly and helpful staff. Park is a big gravel parking lot with hookups. Sites very close to each other. All utilities worked fine. No TV available, but satellite might work on the west side. Wi-Fi worked, but was slow. Walking distance to most of Dawson City. Due to convenience would probably stay here again if ever again in the area. We camped at Gold Rush Campground in a Motorhome. Basically a huge parking lot with rv hookups. Very friendly, helpful staff. Restrooms were clean and well maintained. Laundry was good. Sites very close together. Camped here in a pickup camper. We camped at Gold Rush Campground in a Truck Camper. Tour dredge #4. Dawson City Museum is a must see. I am giving this RV campground a 7 because of its convenient location. Since it is located in Dawson City, it is a short 2 or 3 block walk to all the sites in town. Sites are level, has picnic tables but no shade trees. During busy summer months, RVs are crammed into the park and big Class A rigs might find driving a bit tricky especially if you are a late arrival. You will need to buy tokens for shower but office not always open when you want to bathe so buy tokens early. Staff is friendly and accommodating. The facilities are the typical standard ones you find at all campgrounds. One major negative is the standing water at several sites--it was so bad that our water hose was underwater most of the time at the spigot and easily contaminated with waste water left by previous occupants that may have cleaned their dump hoses. I might suggest you make reservations at this CG because they were totally full the entire 4 nights we stayed here and many rigs were pulling up only to see a Campground Full sign. We camped at Gold Rush Campground in a Motorhome. Dawson City is not a stop where you stay only a night and then move on. It is full of history and charm. The park staff are dressed in period clothing and conduct daily tours of the city during summer months. There are no large grocery stores so prices are so relatively expensive but the ambience is great so you don't mind paying. 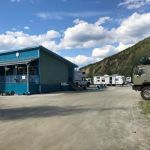 Dawson City and Valdez were two of the most scenic towns we stayed in during our 9 week tour of Alaska. Great location in town. Friendly staff. Easy walking through out Dawson City. I'd definitely stay again when in the area. We camped at Gold Rush Campground in a Fifth Wheel. This is a basic RV Park with some back in spots and some side by side pull thrus. In the back in sites hook ups are to the rear and everything works fine. It is dirt but so is everything in Dawson City due to Permafrost. This is the Yukon. You don't get any better. The owners and staff are fantastic. The park is right in Dawson City within walking distance to everything. And it is a wonderful city to see with many fun things to do. We had planned on staying for two or three days and ended up staying a week. There is lots to do and see. We camped at Gold Rush Campground in a Motorhome. Basically the only show in town worth staying in. All gravel and tight but comfortable. We camped at Gold Rush Campground in a Motorhome. 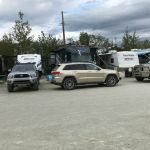 We really enjoyed our stay in Dawson City and the convenience of this RV Park was part of the reason. It is right down town 3 blocks from the Visitor Centre. The office staff is friendly and courteous. The showers are clean and well arranged with private dressing areas, but they do cost $1.50. The laundry is outrageously expensive - $5 for a washer. The price we paid is for only 15A service. This park gets very busy in the summer months so reservations might be a necessary. It is not a pretty park, has very little greenery, and the sites are tightly spaced. However, the location is great. I would definitely stay here again. We camped at Gold Rush Campground in a Motorhome. Are you affiliated with Gold Rush Campground ?